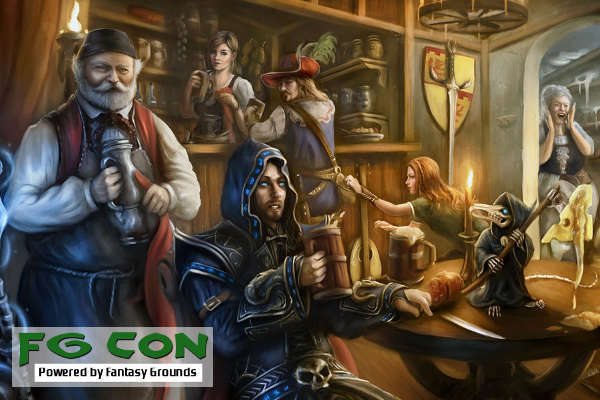 Designed specifically for FGCon this module is an introduction into what can be done within Fantasy Grounds using the 5e ruleset. Players or potential DMs who are unfamiliar with either or both Fantasy Grounds and the 5e ruleset are especially welcome. Pregenerated characters have been constructed and these will be drawn randomly by the players at the beginning of the game. You need bring nothing to the table except yourself. You stopped at this small village just for the night on your way to your ultimate destination. You were only offered cold cuts for dinner last night so this morning you are looking forward to a fine breakfast. But things are not exactly going to work out too well and by the end of the day the matter of an incomplete breakfast isn’t going to seem like too big of a deal. For the record, very familiar with FG workings over the past several years, although I’ve never touched the 5E part of it yet. So a newbie in that facet. I hope to catch on quick though. Then this should hopefully be the perfect introduction. Looking forward to being a random character eating breakfast! I’m guessing it will be incomplete….meaning someone is not going to get a very nice tip. Well, excellent game. Had fun getting a taste for 5E. The session seemed pretty straight forward with some nice puzzles included. Did I understand you correctly that you put this together? Because it had the look and feel of a published adventure. If WotC is accepting submissions, you should consider trying to get the series of “Incomplete meals” published. I don’t know how you’d want to adjust the levels, but the Breakfast one comes across as a great introductory adventure to 5E. A bit of guidance at the beginning to get them into the adventure, some combat, and some puzzle solving all help to cover the mechanics of the game.